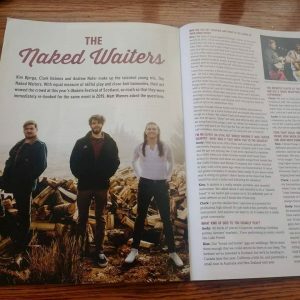 “Kim Bjerga, Clark Holmes, and Andrew Nufer make up the talented young trio, The Naked Waiters. 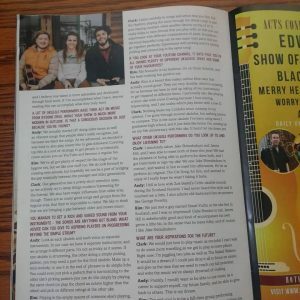 With equal measure of skillful playing and close-knit harmonies, their act wowed the crowd at this year’s Ukulele Festival of Scotland, so much so that they were immediately re-booked for the same event in 2019.” WE GOT AN ARTICLE IN THE UK UKULELE MAGAZINE! Scotland liked us enough to write about our performance, and we couldn’t be more honored. Headed to Vancouver island in a couple weeks for the Nanaimo Ukulele Festival! Door prizes will be given out at the Saturday evening concert and the Sunday afternoon Sing and Strum. A happy afternoon running the Ookestra (Beginner ukulele orchestra) workshop set with the Bayfield Ukulele Society. Lots of fun playing a little big band swing and rocking an 80s classic. Such a fun and talented group! There’s a new place for ukulele playing. Ground Zero Acoustic Lounge, #5 – 1176 Franklin’s Gull Road in Parksville. There’s only 1 spot left in the morning workshop but plenty in the afternoon. The Picking & Strumming Styles workshop has proved so popular that the Naked Waiters will be repeating it in the afternoon so we can accommodate everyone who wants to participate. The workshop will be from 1.30 – 3.00pm and there will be 20 spots available, so buy your tickets early as they are selling out fast. The Songwriting workshop will be reduced to 10 spots to accommodate this change. 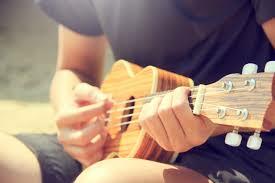 Have you been thinking about playing the ukulele but don’t know how to start, what to buy or how to learn? In this four-week course, I’ll start by showing you the different sizes of ukuleles; you’ll be able to see which size suits you best. I’ll be covering the basics of picking and strumming and you can see if the ukulele is the instrument for you. The cost is $60 and includes the course book. I will have ukuleles available to rent if you don’t have your own (damage deposit required) or to buy. For more information or to register, email ukelessonsliz@shaw.ca or call 250-586-5803. 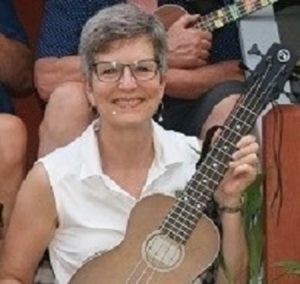 I am a Level 1 JHUI Certified Ukulele Teacher; play in a local band, teach ukulele at Arbutus Music in Nanaimo and at my home studio in Parksville.